You cannot lead while jousting with the past. The direction of your leadership begins with the direction of your thoughts. Remarkable leadership is forward-facing and future-focused. Many of the conversations I have about the future end up focused on the past. People say they want to discuss their future. Typically, they’re fighting with history. Successful leaders know that we all live the future now. Thoughts are bricks. Everything you see began in someone’s imagination. Ignite the imagination of your team. Discuss and adopt a shared picture of the future you aspire to build together. How do we aspire to treat each other? If our efforts succeed, what will we have built? Get specific. How might you live the future today? What does it mean for your team to pivot toward the future right now? Adopt this approach while dealing with complaints. How does the way you are thinking about yourself and others reflect the future you aspire to build? Aspiration matters most when it’s least convenient. Don’t say, “When things settle down we’ll think about aspirations.” That’s fear and doubt talking. Shared vision gives meaning to the mundane. How will today’s actions be a small expression of the future you aspire to build for yourself and others? What are you doing that’s an expression of aspiration? If you keep doing what you’re doing, where will you end up? List three behaviors of great teams. How might you bring one of those behaviors to life today? It’s great to dream about emerald city, but only leaders start building it. 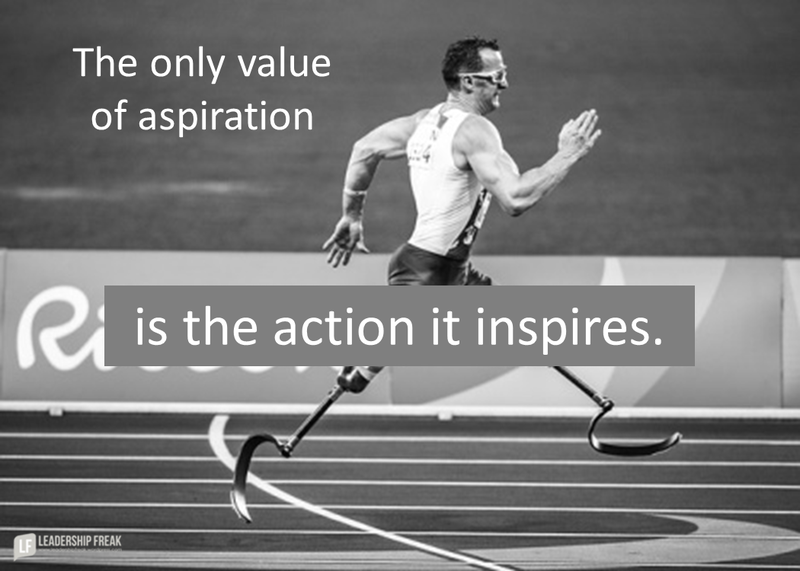 The only value of an aspiration is the action it inspires. What leadership qualities or behaviors are most relevant during New Years? Interesting post. It got me thinking about the role of the past and fear as an inhibitor to growth. It’s certainly true that that is a trap to watch out for. Perhaps though there might also be another role of the past and fear- a cautionary role, that engenders a healthy assessment of risk. Can we pursue our dreams with one eye in past lessons and another on future aspirations?- kind of like roots and wings. I’m wondering how and whether leaders might make use of both. I’d love your thoughts in that. Wishing you and your family a healthy and fulfilling 2017, filled with love and laughter! Thanks Lori. Apparently, all fears aren’t bad. 🙂 Perhaps we need a third eye. One on the past. One on the future. And the biggest one on the present. Thanks for jumping in today! Think about how many changes you have personally seen in your business over the last year, 5 years, 10 years. Is it any wonder market leadership changes every ten years or so? We are seeing change at a more rapid pace than ever before. What are you doing as the leader of your team to identify and adapt to those changes? Thoughts repeated over and over again become beliefs. Teams build strategies based on their beliefs. What if a belief, based on a thought you have told yourself over and over again about your market and customers is no longer right today? As a leader in your organization, make it an intentional step to identify and adjust to changes in your customers and markets. Ignite the imagination of your team on how to adapt to those changes you find…and you might just find your team as the leader in in your market. Thanks Mark. Your insights on adapting are powerful to me. There seems to be a tension between holding a steady course and adapting as you go. Perhaps the idea of a sailboat tacking is useful. Thanks for adding your thoughts. Hello Dan! I hope you have had a great holiday. I really enjoyed this post. So many times, I have found myself saying that I will get to “fill in the blank” when things settle down a bit. The problem is that in my industry, and I imagine almost all others out there, things never “settle down.” Every day is filled with new challenges. And I imagine that any break in the action in today’s world will be so short that it will be gone before we realize it is upon us. As a leader, we have to take the time today to begin preparing for the future opportunities. And you are absolutely right… We first have to let go of the past. Have a great New Year, and best wishes for 2017. Thanks Dan! This blog today got me off my brain dead writers block! Loved this statement: “Many of the conversations I have about the future end up focused on the past. People say they want to discuss their future. Typically, they’re fighting with history” History has a place, but definitely not the place we are to live…just visit and learn from the lessons.